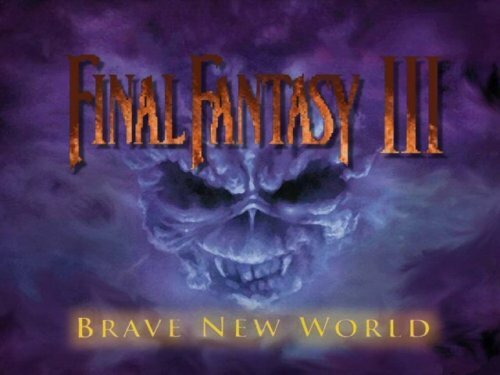 By far my most ambitious project to date, Brave New World began as a joint effort between myself and a coder by the name of Synchysi to completely overhaul perhaps one of the most beloved entries in the long-running Final Fantasy series. It's since grown into a massive community project that's exceeded every expectation I could have possibly dreamed of. The end result is the product of hundreds upon thousands of man-hours from dedicated fans and something I am extremely proud to have been a part of. 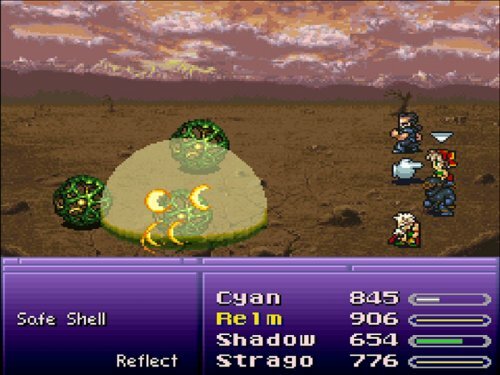 But even though much has changed, I think one player who blogged about our mod put it best when he wrote, "...the goal seems to be to celebrate what makes FFVI the game it is, rather than undoing it and making an entirely new game out of it." 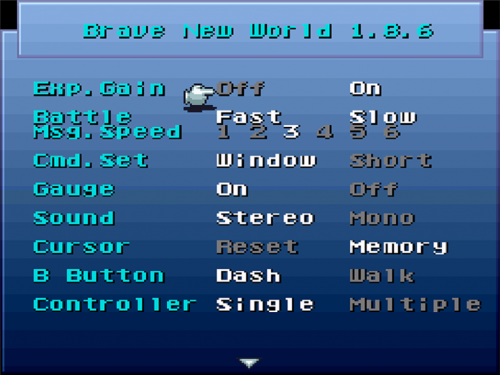 Beyond all else, Brave New World is everything I feel that Final Fantasy VI could have been had Squaresoft had all of the time and resources available to them that we have today. And now, thanks to the efforts of the amazing community that has grown around this mod, it finally has the chance to be exactly that. • Added new hacks which allow stamina to influence counter-attacks and the possibility of "true knight"
Brave New World is an essential upgrade to an already fantastic game. 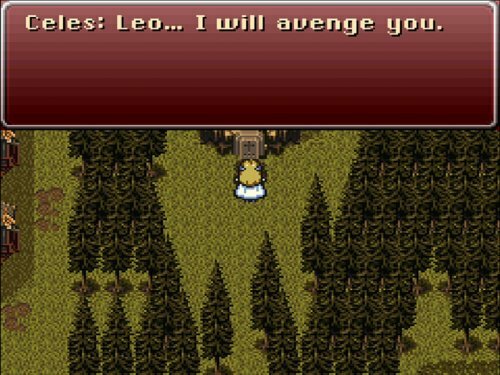 I know we all tend to look at FF6 with rose-colored glasses due to nostalgia but, it definitely had its quirks. Many, many bugs and balancing issues. A great story put on top of an Attack-Spammable combat system with characters that are all identical aside from their sprites. The system was capable of depth, but you had to ignore large parts of the game to get it. Brave New World aims to fix all of those issues and more.. rounding out a great story with some really great strategic character design and scripted fights. The magicite character lock coupled with the varied learned and equipped boosts gives you the ability to highly tune characters to specific rolls. The revamp of skill bugs helps to round that out. I can't think of anything that hasn't been tweaked at some point and improved. Dance, Rage, Runic, Lore, Steal, Throw.. all character specific abilities have been improved and now they all feel useful and not bloated. This isn't so much of a mod as it is a expansion or upgrade.. it feels like it was supposed to be there in the first place and I can guarantee you'll miss its features if you go back to the original or a different mod. It really did ruin vanilla for me. During my 1.8.4 playthrough I did a run specifically choosing people that were not optimal (too low, not enough esper levels, incompatible abilities, etc) for each fight and it did show a few issues with some characters completely crushing others. Given that the original game had everyone able to fill every role.. I feel like this was an intentional design choice by the developers. My purpose in doing so was to get a feel for characters I never really got to use or didn't know how they'd do in some situations. There are definitely perfect characters for each role, good secondary backups for roles, and rounders to fill whatever you may need in a pinch. This fumbles a bit with a couple characters like Locke always being either one-shot dead, one-cast out of mana, or survivable punching bag. This is in part due to him being underleveled for 90% of the game (if you don't specifically stop to address it) and also because he doesn't really have anything to balance it out like Throw with Shadow or Raw DPS and rando buff-heals like Relm. He's just kind subpar at EVERYTHING and can steal things that have no impact. A bummer (and possibly my misunderstanding of the character) but the rest of the characters are great and keep improving.. like the Gown/Brush update or the Rage updates. The biggest criticism I can find while digging is that some of the new systems and scripts can be a bit overwhelming for first time players and people that come in thinking the old use-anyone method is going to fly. Not that they should expect that.. it's clearly right on the label. It's just a mindset that I see people fall into every time they come in. Not sure that's the developer's fault really. But, definitely something to keep in the forefront while playing if this is your first time. Second would be the heavy reliance on a lot of fights being turtle-friendly (sap and heal). I see a bit of work to try to mix it up with the latest patch and there are a few bosses that stop it.. just a shame there are all these new abilities and major confrontations result in button mashing again. Most of the current fights have two gears.. turtle-sap or random one-shots you have to clean up. There are definitely more interesting ones here than vanilla though.. at this point I'm just splitting hairs. That said, it is still the most extensive and improving mod for a game I have ever played.. and I've been through romhacking.net's entire library of full mods (Unsure if the fact I'm not joking is sadder than if I were or not). It was the mod that introduced me to Insane Difficulty and NGPlus and all the great people here. One of the most important, and usually overlooked, parts of a mod is the community surrounding that mod.. they are the ones that give suggestions, bug fixes, and test the mods that get released.. it doesn't matter how good your mod could be if it doesn't have the people to help get there. BNW has that. I really think it deserves 4.5 Stars but not an option. I can't do 5 Stars because.. that would mean it is perfect the way it is.. but I still want to see more updates! Can't recommend this mod more.. even if you weren't a fan of FF6 before, this would make you one. P.S. I do apologize if this review jumps around a bit and seems a bit scrambled. My 4yo loves FF6 and won't stop jumping all over me to mention things about BNW that are cool. If that's not an endorsement you can trust.. I don't know what is. The original copy of Final Fantasy VI, to me, is broken. Once you've gained ultima, you don't need to think about your next actions. This fixes that, and takes the game to a whole new level. Unlike the original, where each character becomes a carbon copy of each other due to magic being unrestricted, this fixes that to a new level. 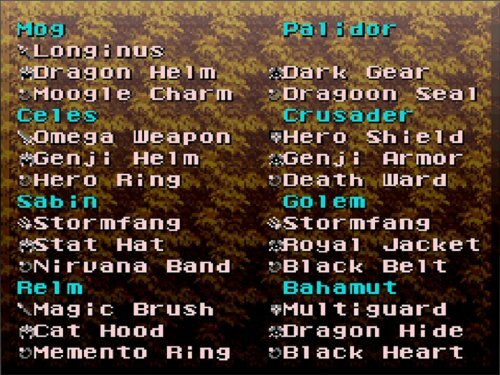 The original game saw Vigor, Stamina, and Speed be marginally useful, while Magic was basically the only stat that truly mattered. Each stat has value and purpose now to allow for characters to be built in specific ways. Do you want to turn Sabin into a Regen tank that heals other characters? Maybe you want Locke to be your healer, so you pump his MP to new heights due to the Esper Level system. Esper levels replace the "equip this esper and gain x bonus" that made gaining levels before espers feel like you were missing an opportunity to make your characters more powerful. This does away with tha completely by utilizing a second leveling system, called EL, or "Esper Level." 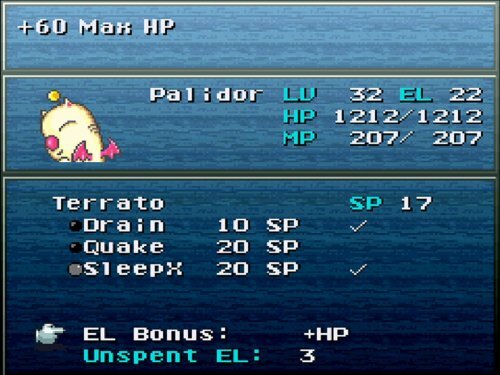 Each character maxes their Esper level at 25, and each character can draw strength from the Espers they can equip. 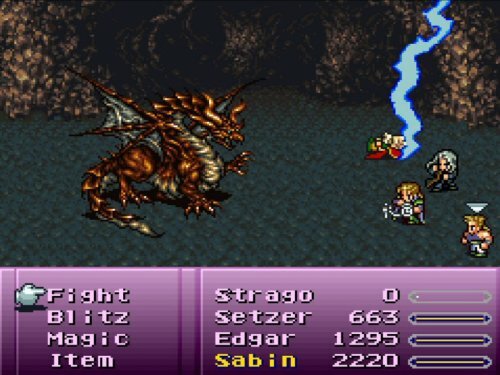 This means that characters like Shadow can only beef up his speed and vigor, while Sabin is focused on Vigor, Stamina, and HP. It also does away with needing to learn magic to 100%, which speeds up the time you would spend grinding to learn the spells that each character has access to by creating a bank of spell points that you gain by defeating enemies. Even with these changes, the game doesn't lose or gain any difficulty. It completely changes the way you think of the game and each character has value in a way that's unique to them. 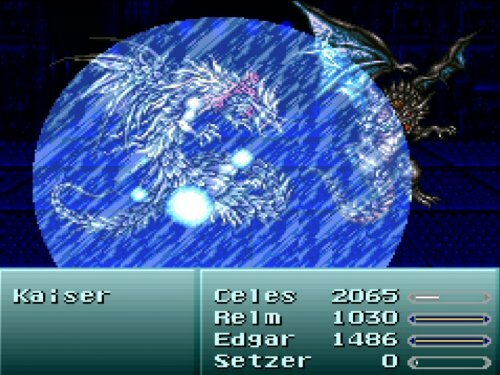 Relm learns some of the most powerful magics, while Setzer learns the best healing spells. This changes how you build each character and subsequently, how you build each party. Making these adjustments it feel like a completely different game that doesn't distract or take away from the main story. It makes playing the original feel, incomplete by comparison. 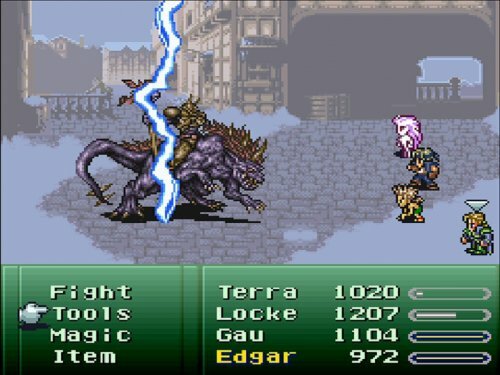 Final Fantasy VI is simply put my favorite game, but even when I have that esteem from this game, I recognize the game is broken. It gives you a ton of absurdly powerful tools which can make the game incredibly easy. I always wanted to know how this game would be with a proper rebalancing and then I saw this mod and I have to say it has even overcome the expectatives I had from it and I definitely enjoy the result. Calling it a rebalancing it's not making it justice. 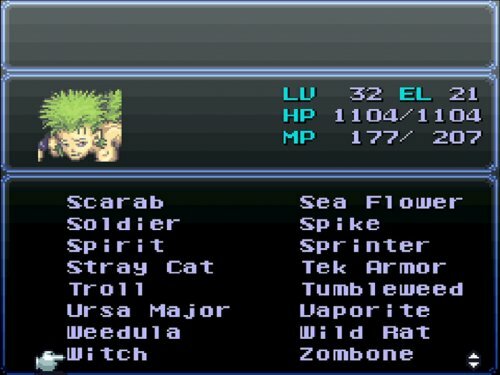 The new esper system adds a ton of strategy layers in the game, making each character versatile, giving them a good amount of tools, but keeping each of their roles diferenciated enough to make them unique. Balancing character versatility, role specialization and balance is something pretty complicated to make, but BTB and Synchysi have made an impressive work there. Of course, this depth would not be nothing without proper enemies and again, they have made a great work with them: even random enemies can suppose a threat if you attack them mindlessly, status effect are actually useful and each tool each playable character have can be put to an use. 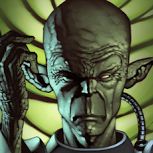 Bosses are challenging and requires certain level of strategy to be beaten without too much troubles, and that's certainly a great point this mod has. I have some complains with their personality choices from a couple of characters and language in Brave New World version, and there are some references here and there I feel them quite invasive, but honestly that doesn't matter too much because the main experience this mod offers -the difficult rebalancing and the strategy layers each character has- is definitely excellent. I would suggest anyone to play this mod if you want to see how much the original gameplay formula can be improved to create a way more engaging experience.